Use these 3 great Midwest focus group facilities to ensure a successful research project. 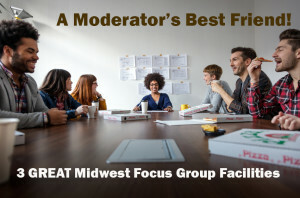 Focus group moderators know that at least 75% of a group’s success depends on the quality of field services provided by the focus group facilities they use. Focus group facilities provide more than just a comfortable environment for participants and viewers. They recruit the participants (and make sure they show up), help manage problems that arise, ensure the room is set up properly and keep the clients feed and happy (which is always essential). I wanted to take a moment to recognize (and enthusiastically recommend) the services of three focus group facilities in the Midwest that I’ve worked with in the last few months. Hatch Global Research: Kelly Johnston and her team did a great job from start to finish. Their facilities in Frontenac, Missouri were beyond impressive. The client seating viewing area was immaculate and the room set up was comfortable for myself and the participants. They did a terrific job of meeting our participant recruitment criteria and the hostesses they provided were helpful, proficient and professional. If you’re doing focus group work in the St. Louis area, I suggest you look them up. Delve: In Kansas City, I had the opportunity to work with Jim Finke and his team at Delve. They had a nice, comfortable and accessible facility. They did a remarkable job of anticipating our needs and the hosts went above and beyond to resolve a potential problem before it even became an issue. I was also very impressed with the participants they recruited. Both groups I moderated at Delve were lively, focused and respectful. If you’re looking for focus group facilities in the greater Kansas City area, Delve is a great option. Vernon Research Group: A great facility located in Cedar Rapids, IA. Joyce Niebuhr provided a warm, friendly environment for the participants and viewers…complete with fresh baked chocolate chip cookies! Their location was a little hard to find, but the accommodations were top-notch. Joyce, and her assistant Blaire, were essential in turning the group session that night into a success. They went the extra mile to make sure my clients and the group participants felt right at home, which provided a great atmosphere for the discussion. There are a lot of great options out there for focus group facilities, but focus group moderators operating in the Midwest will be hard pressed to find higher quality services than those provided by Hatch, Delve and Vernon. If you’re interest in pursuing a focus group project, give us a shout and let us show you how we can help. If you want to know more how to become a focus group moderator, I recommend reading Important Skills That A Focus Group Moderator Should Possess by Neil Kokemuller and sign up for the courses offered by the Burke Institute.